GatesAir threw out the old playbook with PowerSmart®, a pioneering transmitter architecture that reduced power consumption, footprint and maintenance. Breaking new ground in over-the-air efficiency, GatesAir introduced its next-generation PowerSmart 3D architecture throughout its entire TV and radio transmitter lines, doubling operational efficiencies to further reduce total cost of ownership. We are now proud to present our third-generation PowerSmart technology: PowerSmart Plus. With major design breakthroughs and greater modularity than ever before, GatesAir UHF transmitters are able to assure lowest cost of ownership through reduced size, weight and energy use while improving performance. 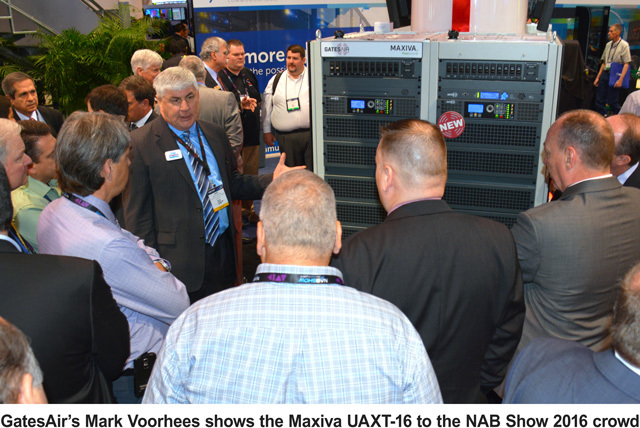 With PowerSmart Plus, GatesAir's Maxiva UAXTE and ULXTE are the optimum UHF transmitters on the market, delivering award-winning quality, best-in-class efficiency, and simplified maintenance and operation. These efficiency increases do not limit the power output capabilities of these transmitters. For example, the market-leading efficiency gains of the high-power UAXT with PowerSmart Plus design deliver 10.8 kW (UAXT-12) and 14.4 kW (UAXT-16) of pre-filter ATSC power to the broadcaster, significantly outperforming the competition with ATSC power efficiency of up to 50% — a first for the global over-the-air broadcast industry. PowerSmart 3D is built into our latest-generation Maxiva (UHF, VHF, DAB) and Flexiva (FM, AM, HDRadio, DRM) transmitters to topple bandwidth limitations and high operational costs for any over-the-air architecture. With the PowerSmart 3D option, our high-efficiency transmitter portfolio has set the general standard in operational efficiency. Over the past 30 years, GatesAir has a rich history of developing energy-efficient broadcast solutions, and our current advances do more than just reduce your power costs. We have optimized our equipment architecture to significantly reduce waste heat, which in turn reduces the cooling requirements for your room. Increased redundancy reduces potential time off-air, and with our improved system modularity, maintenance is easier and less expensive. GatesAir provides the best transmission systems on the market, assuring you the longevity, fidelity, and power that you need. We want to help you see a quicker return-on-investment and fewer costs impacting your margins. For more information on reducing your total cost of ownership, contact us today!